For those aspiring riders who do not want to be associated with the cruising bike genre, and who find themselves unable to ante up the funds required for the acquisition of an ultra-high performance sport bike, Suzuki might have the perfect bike. 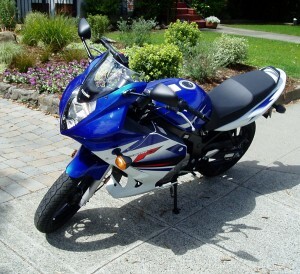 The Suzuki GS 500F, at a base price of only $4,399, just happens to be positioned not only in a most affordable price range, but in a performance capability range that is ideally suited to the entry level rider, as well as being a satisfying and appealing ride for more accomplished riders. Your initial reaction might be, “Yeah, but what’s wrong with it?” Actually, nothing is wrong with it. Yes, it is carbureted and on the cold-blooded side and requires manually choking for a longer warm-up period than one would experience with a fuel-injected bike. This is really a small inconvenience, considering the bike’s initial cost. The Suzuki GS 500F looks like a much more expensive bike with its fixed, full fairing and all-out sporty styling and persona. Another plus is the riding position, which is considerably more upright and comfortable than your traditional hard-core extreme sport bike. The GS 500F’s power source is a 487cc, DOHC, four-stroke, air-cooled twin with electronic ignition (transistorized), an electric starter and wet sump lubrication. Exhaust exits via a right side, upswept muffler. Motive force to the rear wheel is via a final chain drive, metered through a six-speed constant mesh, sequential manual gearbox. Horsepower and torque ratings, as with many bike manufacturers were not available. 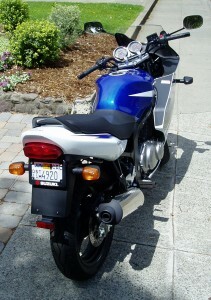 The GS 500F is a comfortably manageable size, with a 55.3-inch wheelbase and overall length of 81.9 inches. Ground clearance measures 4.7 inches and the curb weight is 439 pounds. The bike rides on inverted, telescopic forks with oil damped coil springs up front and a link-type, oil-damped coil spring aft. Tires are tubeless Bridgestone Battlax BT 45F 110/70-17 M/C 54H in front, and 130/70-17 M/C 62H in the rear, mounted on lightweight 3-spoke alloy wheels. Braking chores are adequately handled by single discs both fore and aft. Some may view this as a disadvantage, since most sport bikes feature dual front discs, but the GS 500F comes to a rapid halt without hesitation. In terms of its appearance, the design is unquestionably sporty in either of its two available color schemes: Grey and Black, or White and Blue. 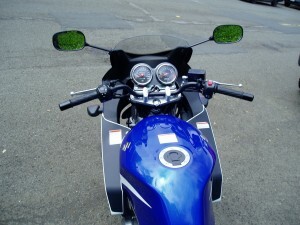 Dual gauges are centered just ahead of the handlebars, accompanied by warning lights behind a mini fly screen. The primary gauge faces are a tachometer and a speedometer. 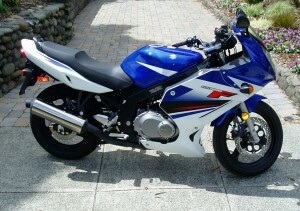 My test Suzuki GS 500F was done in the two-tone White and Blue theme, with red accent graphics. Rider controls for the GS 500F are positioned slightly aft, but not at an uncomfortable height, with pegs provided for both the rider and a passenger. The seat, with its 31.1-inch height accommodates even vertically challenged riders without issue, and the handlebars are positioned within easy reach without laying over the 4.4-gallon fuel tank. The seat is a one-piece sculpted affair with a kicked-up rear section suitable for two-up duty. Once warmed up, the bike’s acceleration is satisfyingly responsive and certainly more than just simply adequate. The torque curve is broad, facilitating a smooth and pleasant transition through the gears. The relatively short wheelbase allows for nimble maneuvering over one’s favorite twisting back roads, and the balance of the bike is pleasingly neutral. Photo: The Suzuki GS 500F looks like a much more expensive bike with its fixed, full fairing and all-out sporty styling and persona. Another plus is the riding position, which is considerably more upright and comfortable than your traditional hard-core extreme sport bike. This entry was posted in 2-Wheeling Today, Rely on the Auto Experts -- Motor Matters Reviews. Bookmark the permalink.